The young motorcycle taxi driver is only too happy to drive me to the tourist dock, where I survey the backdrop of dilapidation and disrepair, one tour bus after the other pulling in, and the elderly European package tourists descending into the dusty putrid mess. How surreal, that this country went from being a total backwater to the most trendy travel destination in the world in one fell swoop. 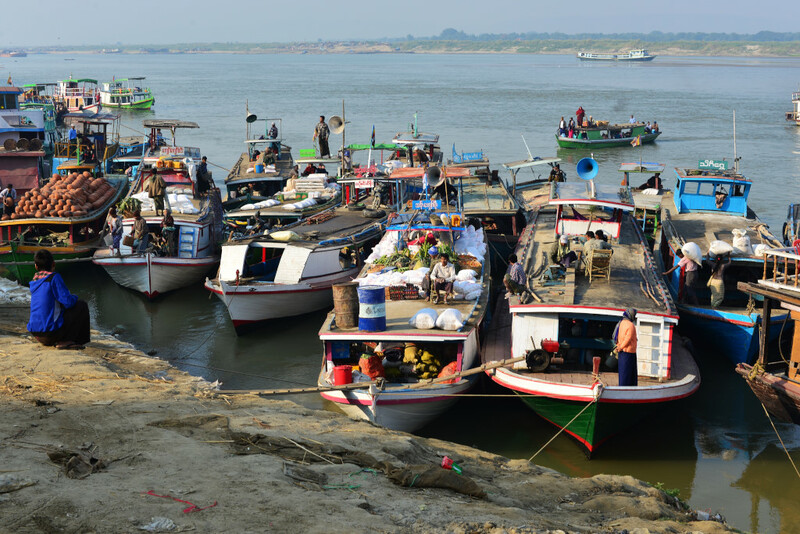 Looking around the chaotic proceedings, the dirt, the small Burmese swathed in heavy clothing toiling to haul goods in various shapes and sizes onto the heaving weatherworn wooden boats, the paint peeling, the entire scenario one of decay and misery, ameliorated by the beating sun above us. 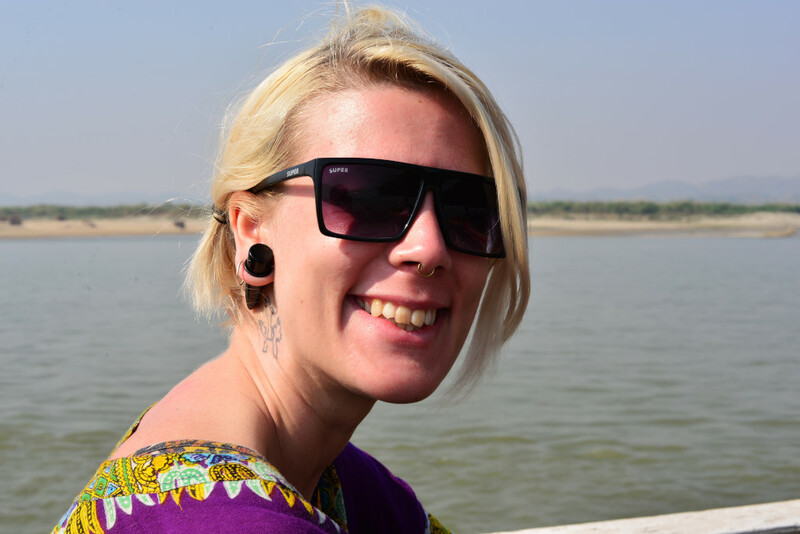 I speak with a young Swedish woman from Stockholm eager to take in the excitement of Myanmar on a side trip from Thailand, which she has visited numerous times in her life. Watching the carnival of tourists arriving unfold before us, we chat about traveling, and then are finally herded onto one boat. We are barely seated in the reclining chairs at the back of the upper deck, whereupon we are commandeered to walk the rickety planks hanging over the murky waters to another boat, where we hope we can keep our seats in the growing heat. 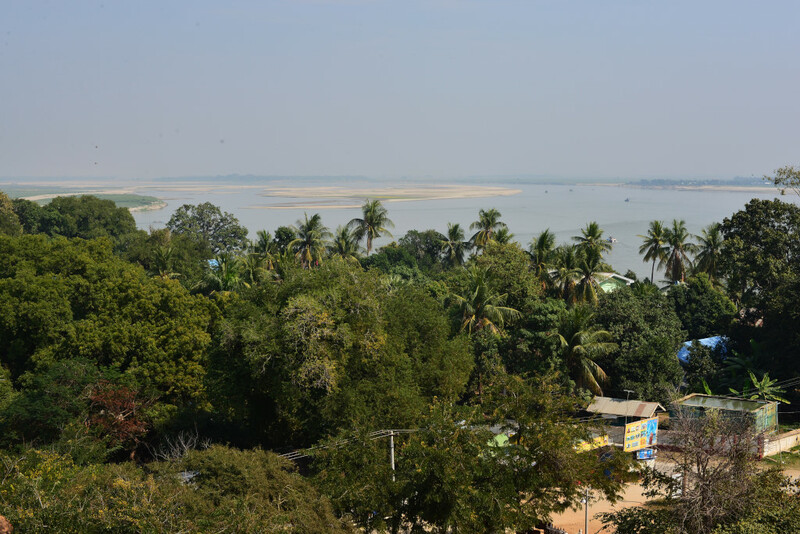 The boat eases away from the muddy shore and into the turgid Irrawaddy, our conversation ranging from the marvels of Swedish food, the drinking excesses that characterize the people, and the beauty of her city, one she would never want to leave in the summer. It’s been a very long time since I was in Stockholm, but I do remember a very beautiful place. Land in the city is utterly unaffordable, but she is lucky to be renting a place for next to nothing a half hour metro ride into town. Her friends berate her that she is too far away, but she gladly trades off the sacrifice of a small commute with the amount of money she can save. 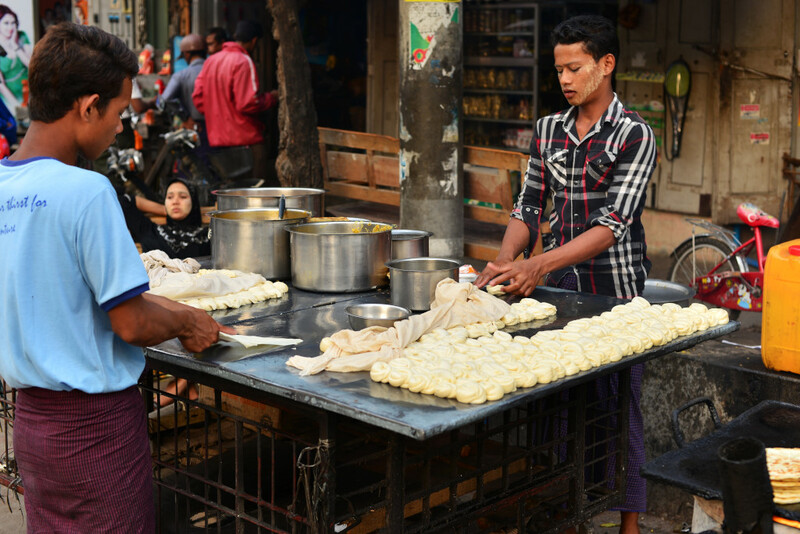 The country’s food represents another great allure, although she tells me there are things not so enticing, such as a fermented fish dish that most would find fairly disgusting. I have to say that I have seen very little of Scandinavia in general but have strong impressions of the people and culture. She expresses the passion that the Swedes have for the summer, the celebration of mid-summer that is so important to the people, and how the country shuts down in the winter, the people reduced to utter misery at the ongoing cold and darkness. I tend to swerve in odd directions and express off-beat opinions in our conversation, which she catches gracefully and effortlessly, speaking in an easy but reflective and non-judgemental manner. 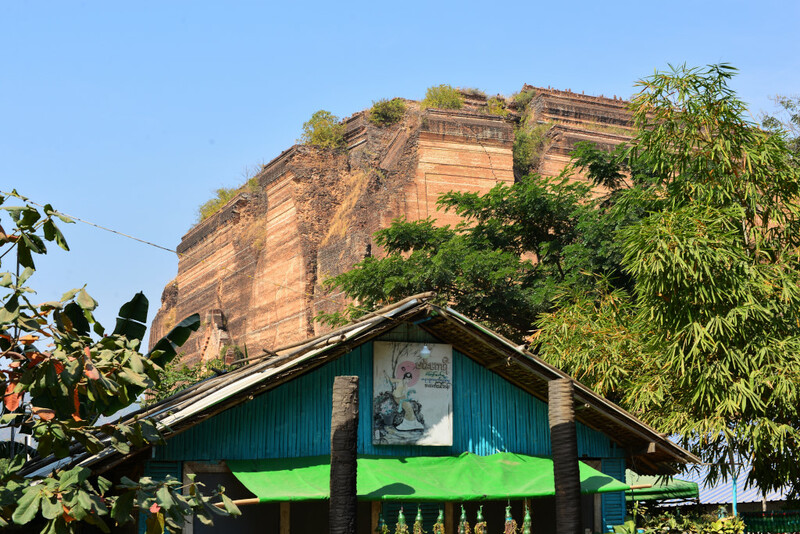 We slowly approach the grassy shore, the profile of Mingun dominated by what looks like a towering butte with small outcroppings on top. We disembark, although it is unclear as to where we should be proceeding – perhaps just following the others would be a good idea. A sense of pervasive tranquility emanates from the motionless wooden boats anchored by the shore bank and the wide canopies of the trees shading the dusty road on which the occasional local trudges slowly. 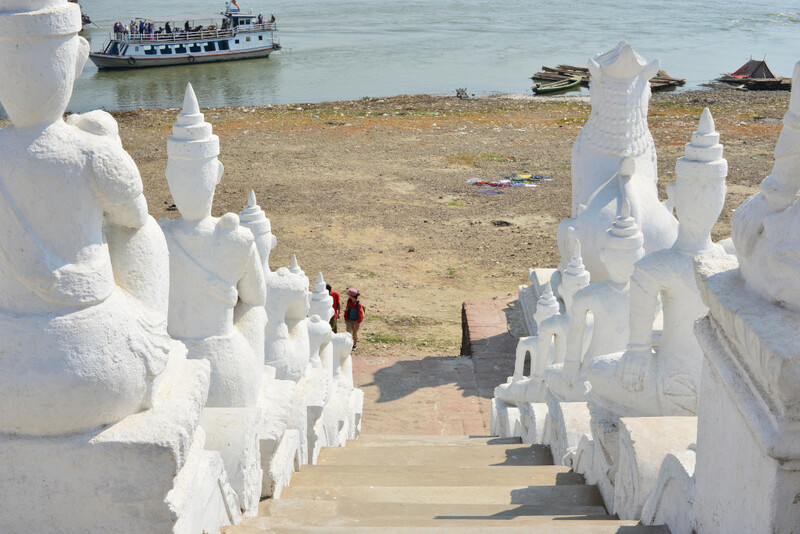 To our right, a white-washed chapel with small golden stupa-like cone faces the river, a sequence of seated Buddhas lining the descending staircase to the water, the meditative space interrupted only by an enormous lintel peering out from the pavement in front of the temple, as if it had surreptitiously crash landed. 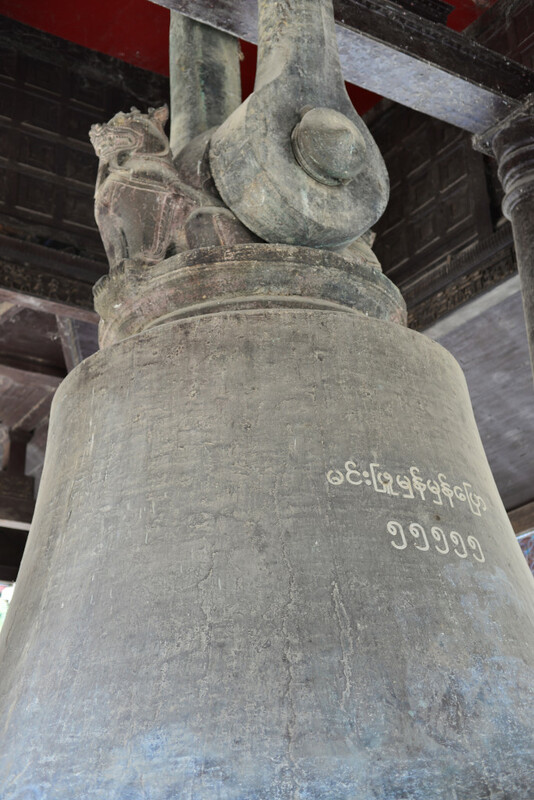 Mingun is known for the ruins of the great temple, as well as one of the world’s greatest bells. 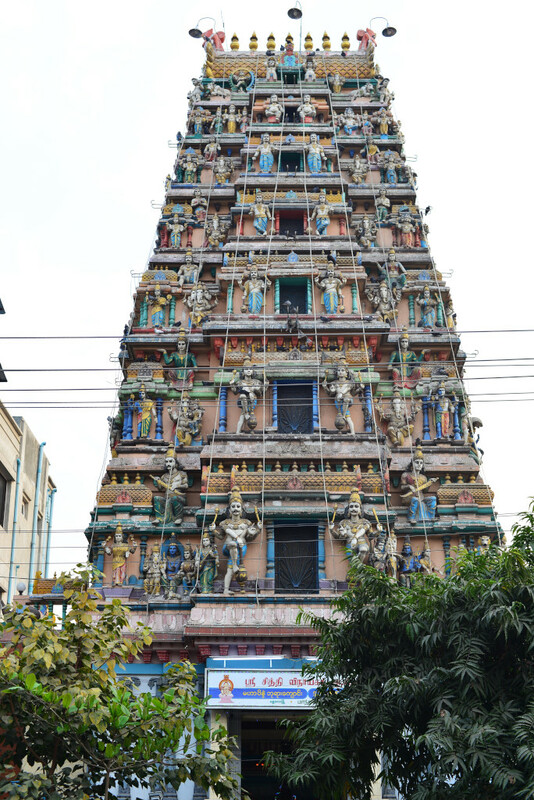 The temple was intended to be 150 meters square, the bell measuring 13 feet high, 16 feet across the lip, and weighing in at 90 tons, the second largest ringing bell in the world. 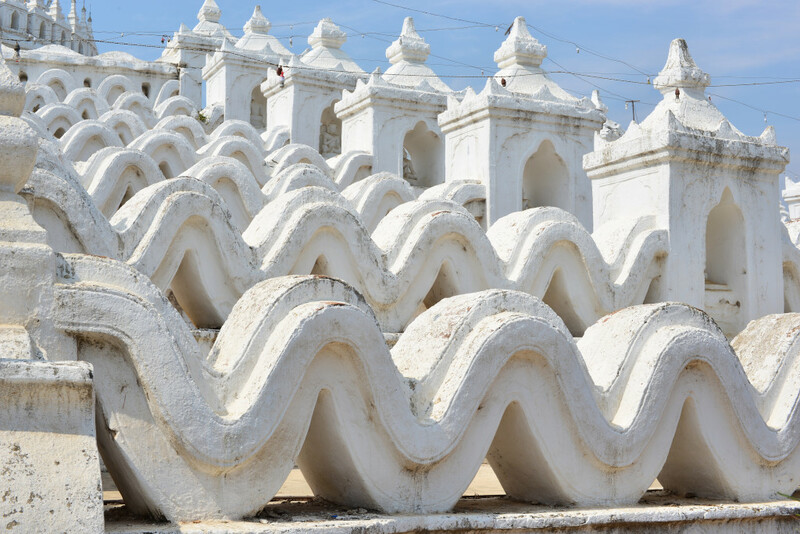 This vanity project was commissioned by King Bodawpaya in the late 18th century, using thousands of prisoners of war from his expansionist campaigns and slaves working on the construction of the stupa. 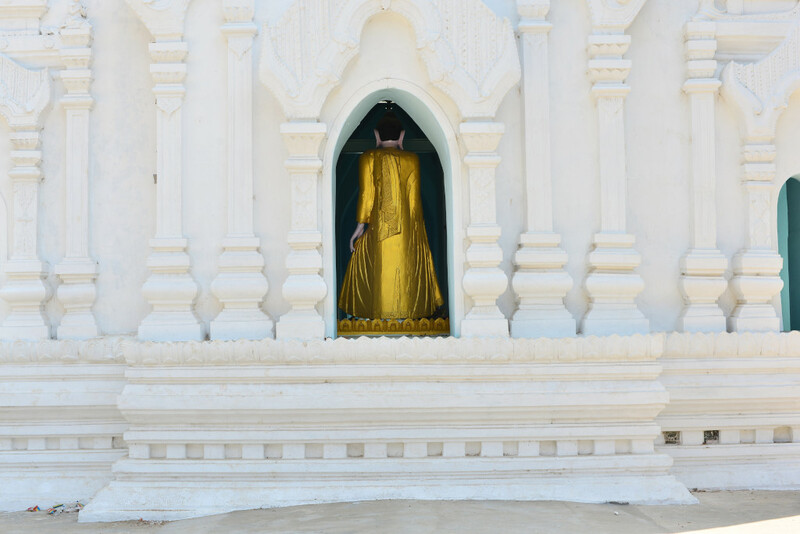 Given the resentment towards this megalomanic project by the underpaid and exploited workers, it was whispered that the king would die if the temple were ever completed – and hence it was not, and Mingun was abandoned. 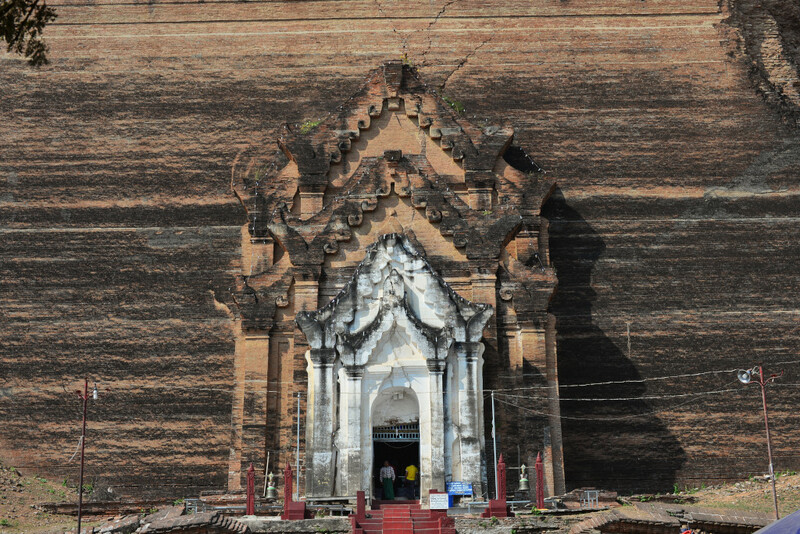 Pahtodawgyi Paya only reached half of the intended size before being abandoned. Bodawpaya also ended up being the last great king of the Burmese, whose forays into Arakan bordering on Bengal provoked the eventual ire of the English, whose lust for conquest soon vanquished the Burmese altogether. 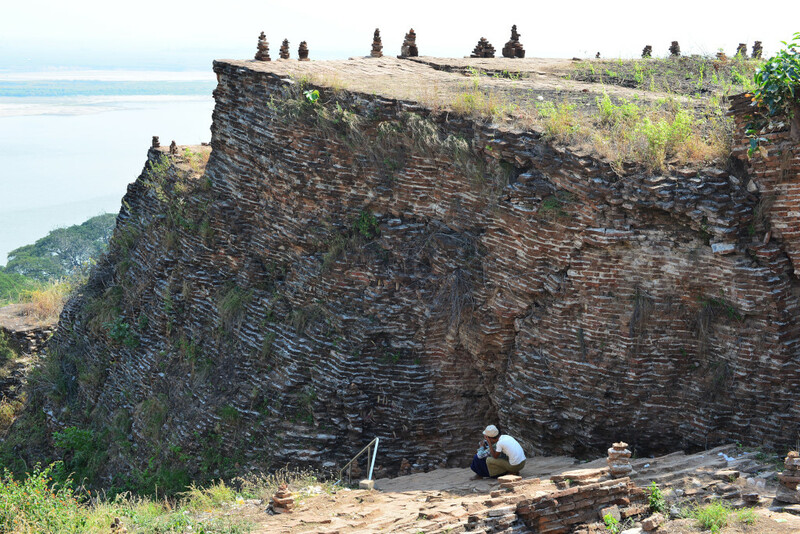 The sense of tranquility is disrupted when we reach the principal attractions of Mingun, the enormous, butte-like stupa into which hordes of tourists are flowing, although they can only be seen on the lower staircases and terraces. 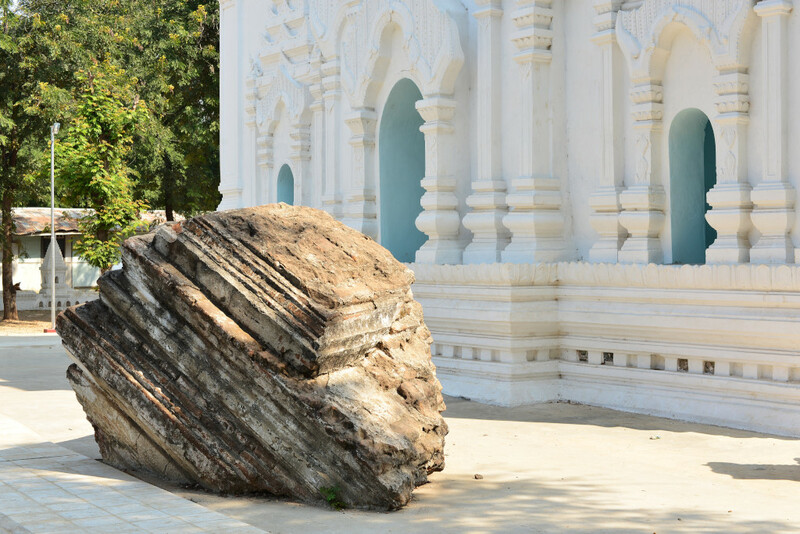 Severe damage was incurred from the earthquake of 1839 and again 2012. 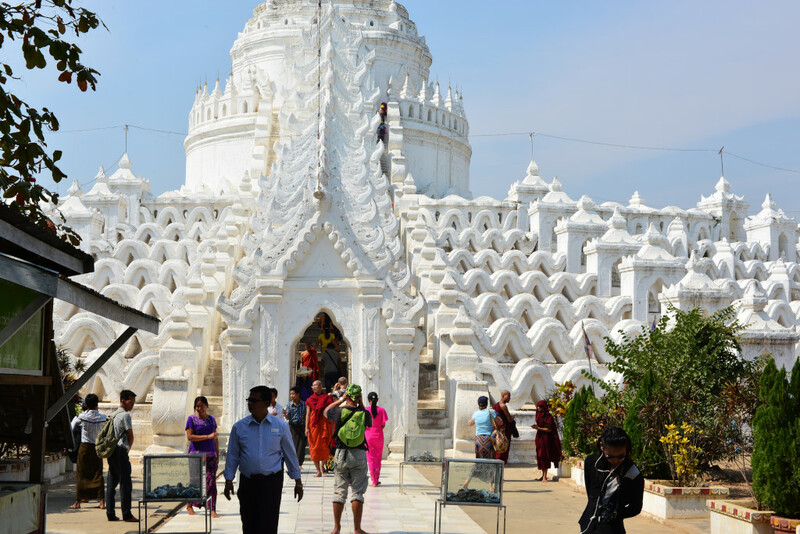 It turns out that the small whitewashed Pondaw Paya we previously viewed was in fact built as a model for the Pahtodawgyi Paya. Climbing the rickety stone staircase to the top, we are only able to survey the surrounding landscape from the edge of the structure that had effectively been severed from the main buttress as a result of the devastating seismic activity. Through the now overwhelming throngs of tourists and vendors selling every manner of claptrap, the whitewashed Hsinbyume Paya rises squatly before us, the narrow staircases filled with visitors slowly filing up and down the stairs to the summit, our exhaustion building from the increasing heat and climbing. Wide round terraces rising concentrically towards the summit providing an escape from the sweltering crowd, the low crenellated walls offering views into the fecund landscape. 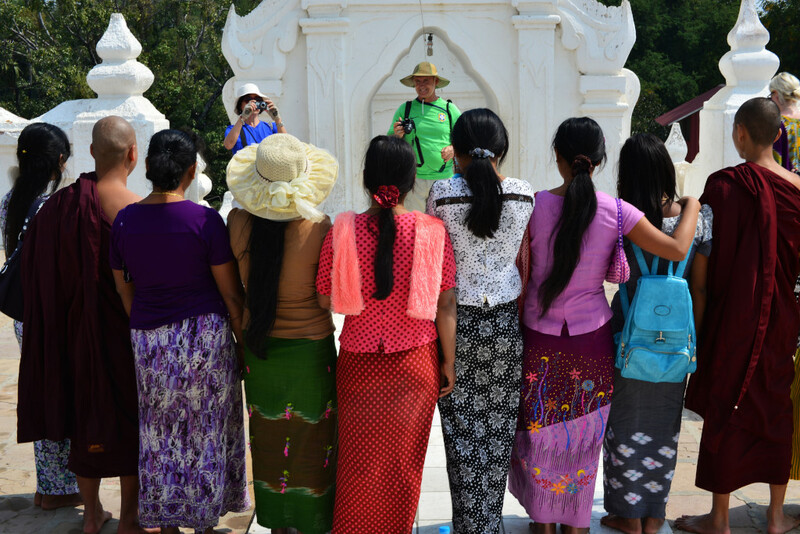 Fecundity is also on the mind of the troop of young local women eager to capture as many photos of the tall, young and handsome Frenchmen at the peak of the pagoda as possible. But where is the bell that everyone comes here for? 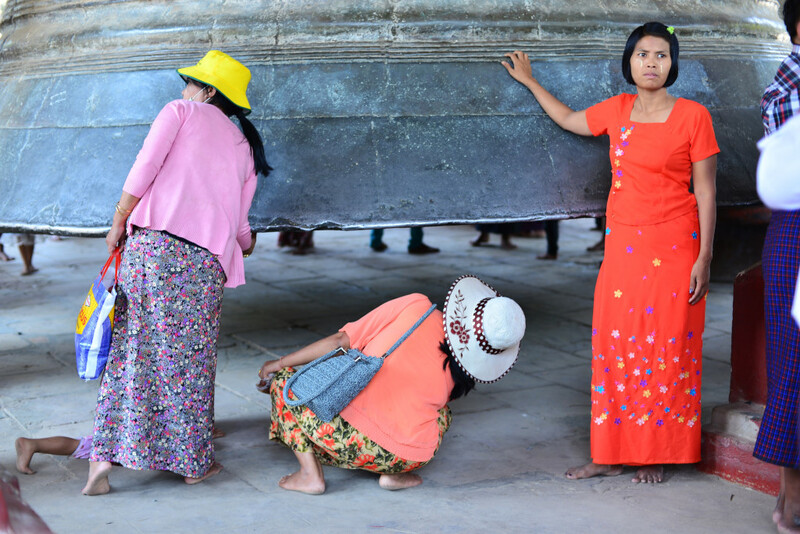 Right before us it turns out, and surprisingly, most of the visitors to see what was once the world’s largest bell are actually Burmese, providing an entertaining and engaging alternative to the usual hordes of Europeans. 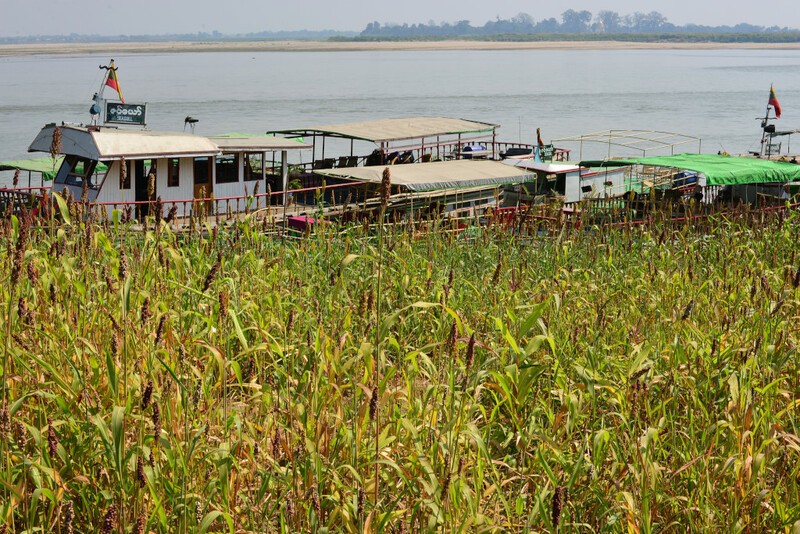 I can’t say I am not happy to be returning to the boat, as exhaustion has really hit me in the last while, the endless crowds diminishing the potential sense of discovery and adventure in visiting Mingun. Sitting laboriously on the grassy embankment, we watch tourists returning to and embarking on the wooden boats. The boat we came on is empty, and I believe the idea is simply to board the next available boat, rather than the boat that transported us here. It’s not as if anyone is throwing us off the boat whose gangplank we walk onto. 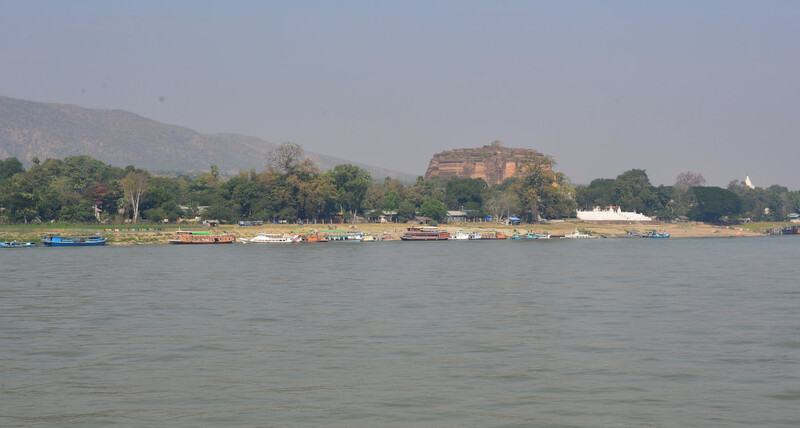 Marta asks a man sunk into his lawn chair in the front of the seating area whether the boat goes to Mandalay, to which he responds affirmatively with the predicable amount of sarcasm – where else do you think it would be heading? Slumped into our own chairs laid out on the deck in the blazing heat, our conversation proceeds haltingly, being too tired to be able to say much of meaning. 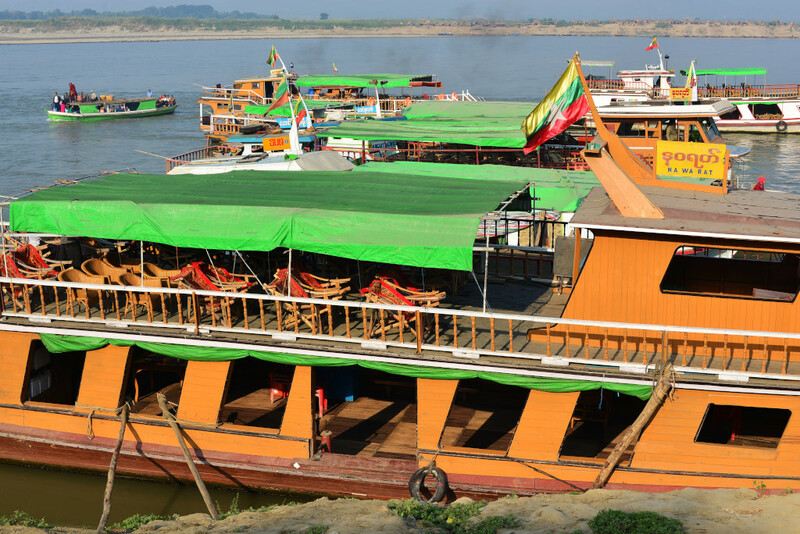 Soon the boat departs, drifting down the river as we drop off into a slumber, awakening as the boat pulls into the disheveled dock in Mandalay. 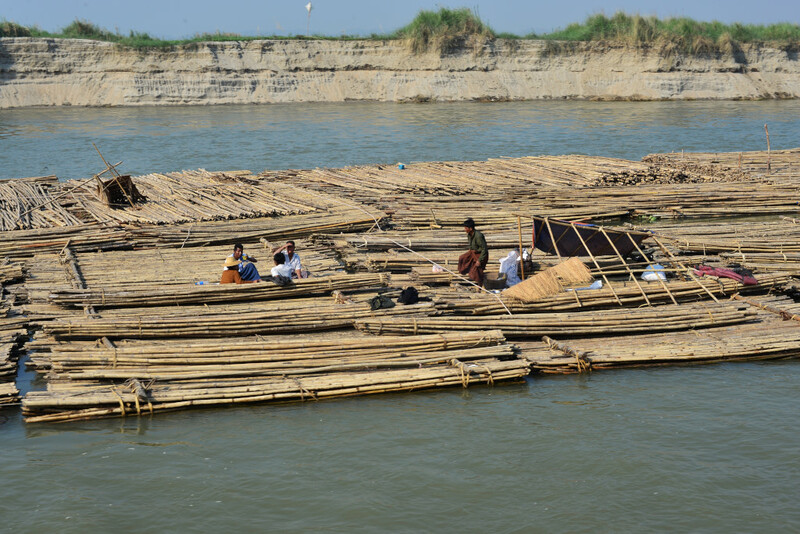 We follow the remaining passengers, staggering along the shaky planks, careful not to tip into the murky waters, the chalk-faced local women pounding their laundry amidst the worn and faded hulls of the hulking boats. We are accosted by motorcycle taxi drivers as we climb up the river bank, definitely a change from Thailand where the taxi and tuktuk drivers are very nonchalant. As nice as they may be, you have to be firm to get rid of them. There is of course a very good reason they aggressively pursue tourists, since they stand to make fares at five times the rate that locals would pay, and it’s not as if money is plentiful otherwise for the poorer locals. The Irrawaddy waterfront is a mess of transport vehicles and small eateries interconnected by copious amounts of grime and dust, the pots laid out on the tatty plastic sheeting containing cold and greasy remnants of the morning’s food that would have been utterly unappetizing when it was made, never mind the impression it makes now. Marta wants nothing more than a beer, and barring that, any kind of drink. I am thinking of eating only to spend some last moments together, but this venue is truly uninspiring, not that it is so much worse than the rest of the city. I really should have rehydrated while at Mingun, but was too cheap, as everything was twice the price. The air is thick with exhaust fumes, the smell of burning charcoal, traces of incense and burning plastic, and short of some inane discussion and stares from the locals seated at the remaining tables, I believe Marta should go on to Amarapura as expediently as possible, allowing me to return to town to eat, shower, have a quick coffee and visit the fort before it closes, admittedly optimistic plans. The motorcycle taxi driver gives the impression that he knows exactly where to go, but I am repeatedly disquieted by his desire to head northwards from 26th Street. Finally confronting him, I ask him if he has any idea as to where he is going. When he begins chanting random numbered streets I think it best I point him down the specific streets, not that I should be giving anyone driving instructions in Mandalay. I am curious as to whether I can locate the Indian restaurant I saw yesterday again, but it seems to elude me. But it matters little: the old man climbs the four floors laboriously to his room, baffled at his intense exhaustion. I look at my face in the mirror and it is dark red, the sun burning much more intensely than I would have expected, an obvious symptom being sunburned and dehydrated, although I am also beginning to wonder whether the anti-malarials are having a debilitating impact on me. From the rear of the motorcycle taxi and onto the waiting bicycle, now lurching along the bumpy roads, looking in seeming vain for the Indian restaurant I had wanted to eat in. North on 83rd and all the way to 24th, and nothing. Back all the way onto 82nd, and nothing, not understanding how the Tamil temple and nearby Indian restaurant could simply have disappeared. But it has, and my exhaustion can’t possibly be rendering me that delusional. One thing is apparent: this area is entirely bereft of formal restaurants, food being almost exclusively available from street vendors. Heading back down 81st, though, I find it, first the adjoining temple’s Dravidian-style gopuras, then the restaurant. I am sure that yesterday the lettering was both in Burmese and in English, but today I stare blankly at the exclusively Burmese lettering, unsure of how to proceed. The young waiter readily procures an English menu, not surprisingly, considering that a foreign couple is seated in front. 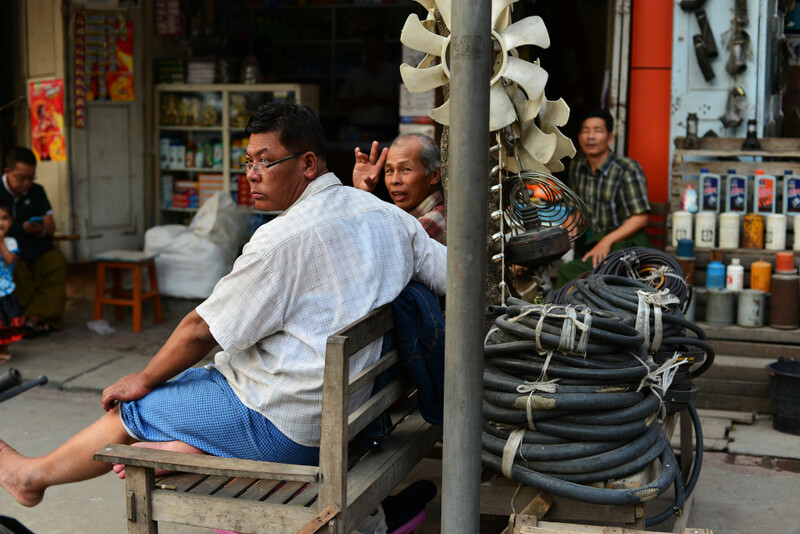 Caucasian tourists can be seen everywhere here, young couples, older couples, perhaps not in the droves we saw in Mingun, but they appear on the street at regular intervals, irrespective of where I find myself, and Mandalay is hardly that tiny. I eat most of what I find on the plate, leaving anything that contains fish paste, as it’s too much for even my normally iron stomach. I can barely walk to the bicycle, which returns me the handful of blocks back to the hotel. Lying down on the firm mattress in my room with the air-conditioning on feels like the perfect elixir for the scorching afternoon, and yet I tell myself to hurry, to get up, take a shower, to pack my things again, and leave the hotel. But I balk: I am tired, and just want to rest. I have made the late afternoon’s quest a gym that I was told supposedly is found somewhere east of the train station. I continue to the area of 37th Street between 75th and 76th Street, but there is no trace of a Fitness Centre. 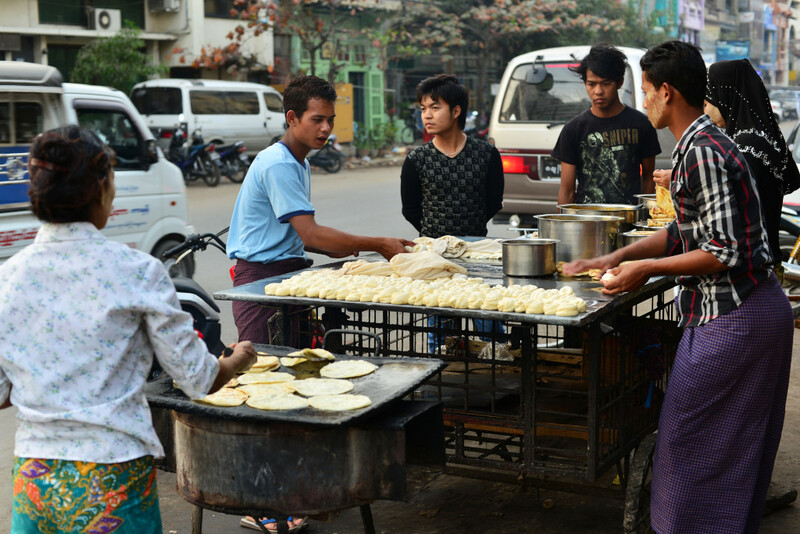 Amidst the luxurious hotels, ample bars, and simple eateries there are many hair stylists to be seen, although I doubt anyone would be happy with a request to simply cut hair, given the propensity of young Burmese to wear their hair in gelled, swept-up cones. 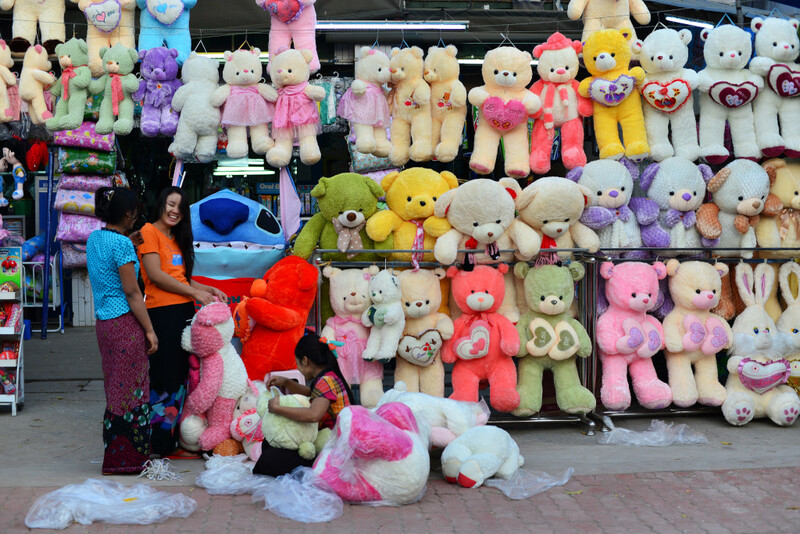 Stands piled high with giant teddy bears and fake flowers are accompanied by nauseatingly loud pop music, presumably in preparation for Valentine’s Day in the next few days. 75th Street is extremely busy, vibrant with nightlife, bars, traffic, sprawling outdoor eateries filled with young locals quaffing beer, the somewhat putrid smells of the local cuisine wafting into the street. And surprise of surprises, there is no fitness centre on 79th Street either. Returning on my bicycle along the 35th Street thoroughfare to the west side of the train tracks, I confirm that there also no fitness centre on 79th Street between 32nd and 33rd Streets, not that I had the remotest confidence that I would find anything, but then rediscover the same fruit stand I saw earlier today on the corner of 80th and 31st Street. A beaming friend of the owner walks over with the beautiful baby boy in her arms, who waves a greeting to me. The shop owner gives me a rundown of prices: mandarins from Myanmar are 200 kyat a piece, the higher quality smaller tangerines 300 a piece, but the good oranges from China 1,000 kyat a piece. I tell her that the same oranges from China in Canada would be a fraction of the price, and that involves product shipped across the ocean. Of course in the Canadian market, the Chinese oranges are competing with the industrial production in Florida and California. Continuing, she tells me the snake fruit comes from Thailand, and pineapple and excellent papaya from southern Myanmar, where it is tropical. I suspect that the plentiful ripe watermelon I see on the streets is also local. Now very frustrated, I head westward on 30th, stopping off at a larger hotel, insisting that someone actually make an attempt at giving me a legitimate location. If you don’t know, tell me, but don’t send me on another wild goose chase. The flustered young men do their best to comply, not that I have any right to make such demands of them, and not that the information they give me is really any better than anything I would have gotten from anyone previously. Before continuing to another chimera, I really would like to eat – I am not particularly hungry, but once I return to the west side of the tracks the culinary offering will be an absolute desert, unlike the vibrant 77th and 78th Streets. The large, bright Top Merit seems to be a good choice, the valets rushing to assist me in parking my decrepit rental bicycle before I stride purposefully into the vast open space of the somewhat faded diner with the usual tatty plasticized menu featuring photos and accompanying Burmese and English text. I am too mentally exhausted to attempt to parse through the Asian food choices, second-guessing what they could be, and how well and authentically they could be made, and so opt for some wholesome juices and a chicken burger and fries, which is at least familiar, and preferable to the grim choices on the street. The small lanky locals are only too happy to serve the foreigner, not that there is much other clientele. On one hand, the prices here are not that high, but on the other, there are actually lots of competing restaurants in the area. Considering the plethora of bars in the area full of young locals drinking, it is apparent that there is definitely enough money flowing around to pay for their alcohol consumption. Back at the hotel, having entirely given up on my search for a gym, I interrupt the young Russian who was on the tour to Mingun returning to his room to ask him what he thought of the trip. Initially he is hesitant to respond, which seems to be due to a lack of English comprehension, but as he elaborates, it would sooner appear that he doesn’t want to appear too negative. He expresses his disappointment that the raison d’etre of any natural environment in the county is linked to Buddhism, but then I point out that the Russians’ deep mysticism is also intimately tied with nature – how different would that be? He doesn’t really want to continue the conversation – his bedtime has arrived, and he just wants to get to sleep and deal with the cold he picked up. Fair enough, as I normally stay up far too late myself, hence really should try and get to bed earlier and deal with what seems to be my own minor cold. No, he doesn’t think his cold is due to the pollution – it’s hardly more polluted here than Moscow!